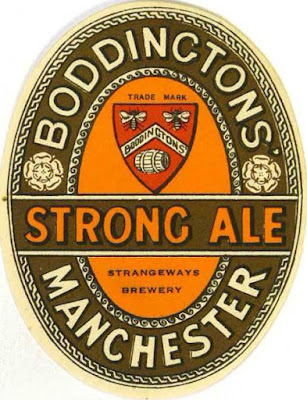 They might only have brewed a handful of different beers, but Boddington used a surprisingly large number of ingredients in their grists. There were no fewer than six types of malt: pale, high dried, black, crystal, enzymic and wheat. Though I’m not totally sure that the last one was malted. The brewing record merely says “wheat”. Enzymic malt (also called Dixon’s malt, after its inventor who was head brewer at JW Green in Luton) was meant to help with conversion in the mash tun. Whether or not it really had much influence on mash efficiency isn’t clear, but it was very popular, especially after WW II. I’m not sure why Boddington only employed in their Bitter and Mild. I assume that the wheat was used for head retention purposes. That would explain why there’s more in the Stout. Drinkers expected Stout to have a thick, creamy head. The grist of CC is quite odd, containing a high percentage of crystal malt and flaked maize, but less than 60% base malt. Boddington employed almost as many different sugars as grains. Mostly proprietary sugars. Each of the four beers had its own particular blend of sugars. IP and CC both have three different sugars that combined only make up 6% or so of the grist. I’m guessing that the invert was No. 3 invert, as that’s what was normally used in Mild. But there’s no guarantee. DMS stands for Diastatic Malt Syrup, presumably used as another add to mash conversion. It’s something else that regularly pops up after WW II, but wasn’t so common before it. Br, FL and B are all rather enigmatic. I’d be lying if I told you I had any idea what they are. Other than types of sugar, obviously. Boddington Bitter was renowned for being very pale in my drinking youth in the 1970s. Looking at the grist for the 1939 version, which contains neither crystal malt nor caramel, Boddington were also back then trying to keep the colour as pale as possible. Boddington brewing record held at Manchester Central Library, document number M693/405/129.